Deshawn Henry, a senior civil engineering major, appears on a poster in Davis Hall and on UB engineering pamphlets displaying student research. Like many excited freshmen, Michael Kuczkowski hurriedly clicked through all the rules and regulations on the UB website so he could complete his enrollment process for the start of the Fall 2016 semester. It was a giddy time for him. He was excited to sign up for his political science major, explore UB’s numerous clubs and start his college experience. As he scrolled through and rapidly hit “accept,” he never considered what powers he was granting UB or that he was – as UB argues – giving the university the right to use his image. 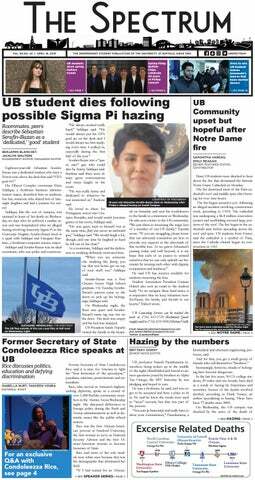 The paragraph, administrators argue, means that if a UB photographer takes a photograph of Kuczkowski or any other student on campus, the image can appear in campus ads, brochures, billboards and even elevators. The university argues it doesn’t need individual permission because the paragraph grants it. “I think that they could explicitly explain their policy better,” Kuczkowski said. That’s what other prominent universities like Brown and Northwestern do. At Northwestern, photographers are required to have written permission from any recognizable person in a photo with intended use in university web and print publications. At UB, students don’t always know photographers have taken a photo of them since many photographers use long lenses. And once a photo is taken, students have no say in how their images are used. Sometimes, images are used out of context. In a March ’16 story called “Face Value,” The Spectrum spoke to Angel Cardona, a junior communication major, whose picture is on the front of a transfer student brochure. Cardona, however, is not a transfer student; he only learned his photo had been used when students stopped him in the halls asking him about how he transferred to UB. Matt Vanderwerf is shown decked out in UB garb on a banner encouraging UB students to “stay longer” on the walkway from Clemens Hall to Lockwood Library. Vanderwerf dropped out after only a few weeks at UB. Several other students whose images are on banners, elevators and brochures told The Spectrum that UB had not contacted them about using their images and that they were surprised to see enormous images of themselves on elevators, in hallways and on promotional materials. Mickey Osterreicher, General Counsel for the National Press Photographers Association, thinks UB is treading in a gray zone of fair use of images. Osterreicher argues that if UB falsely represents who a student is, the student has a case to ask for compensation for the use of the image or the removal of the image. In some cases, the university does reach out to faculty for recommendations on students to be featured on posters or advertisements. Henry researched a groundbreaking method for third-world countries to treat water. UB wanted to document the successful project and use it as a marketing tool. The project was important to him and he was pleased to have the chance to share his experiences. He also thinks being African American helped in his selection. “I feel like since I’m a minority, they probably saw it as an opportunity to showcase their diversity along with the research students can participate in,” Henry said. The Spectrum questioned why UB doesn’t ask students to pose for specific images. UB Spokesperson John Della Contrada says some pictures are posed and others are organic. Henry thinks the way UB approached him was appropriate and that officials should always ask permission before using a student’s image in a bold way. Other legal professionals agree and think that UB should implement a separate waiver when student images are used. Mark Bartholomew, a professor at UB’s law school, said UB’s policy is broader and more vague than the policies at other large state universities. Brown University’s policy states that “if a student is identifiable and their image is being used for marketing or promotional purposes,” the school needs written permission from the student. “This applies when an individual or individuals are identifiable and “featured” — the focus of an image — for websites, publications, e-communications, social media etc. for the purposes of: promoting academic or administrative programs; promoting events in advance; fundraising; recruiting; and encouraging attendance or participation, etc.,” the policy states. Rhode Island has different variations of photo rules at the state level, but Bartholomew argues that the premise of students’ publicity rights is still effective nationwide. The vague wording of UB’s consent paragraph has left some students wondering who they should contact if they want to “opt out” of campus photos. The website does not offer contact information or an “opt out” choice. Sonan Lama, a sophomore business major, didn’t know he had the option to request that the university not use his photos. After learning about the school’s policy, Lama said he may consider opting out so that he won’t be photographed. Students should contact University Communications if they wish to “opt out” of having their picture taken or remove an already published picture, according to Della Contrada. “We recognize that this is not always an ideal situation, which is why [we are] updating current practices so that members of the campus community are more aware of UB’s photo practices and have more opportunity to select how their images are used,” Della Contrada said. Unlike regular UB students, all student athletes in the Mid-American Conference have to sign a photo waiver through the athletes’ partnership with SIDEARM Sports Services. The policy states that “any public information an athlete discloses, including pictures becomes public can be used for online and offline promotional or commercial uses in any and all media.” This protects the athletes’ privacy and publicity rights and gives the school permission to market their images. Bartholomew says that a student’s publicity rights could be violated by marketing without consent. But, if there is no emotional or financial damage resulting from the image use, UB is not at fault. Della Contrada released a statement indicating UB’s plans to update the university’s photo practices. The Spectrum’s original story wasn’t the catalyst for the policy’s change, but helped in addressing current issues. The new policy will give students more options if they choose to opt out of university photo practices. UB’s updated practices will give students the opportunity to opt out of having their image used for specific marketing purposes, according to Della Contrada. The university aims to implement the updated practices during the 2017-18 year. Della Contrada did not specify how the policy will work and if students will be able to opt out of having pictures taken overall, or just for marketing purposes. He also added that University Communications has never received a complaint about a photo that was used and people have requested beforehand that photos not be used, and those requests have been honored. Lama is thrilled the university is making changes and hopes it will help students understand their rights. *Editor's note: The original article said the university aims to implement the updated practices this fall. Max Kalnitz is the senior arts editor and can be reached at max.kalnitz@ubspectrum.com.